A crisp June breeze grazes my cheek as I close my apartment’s gate behind me. 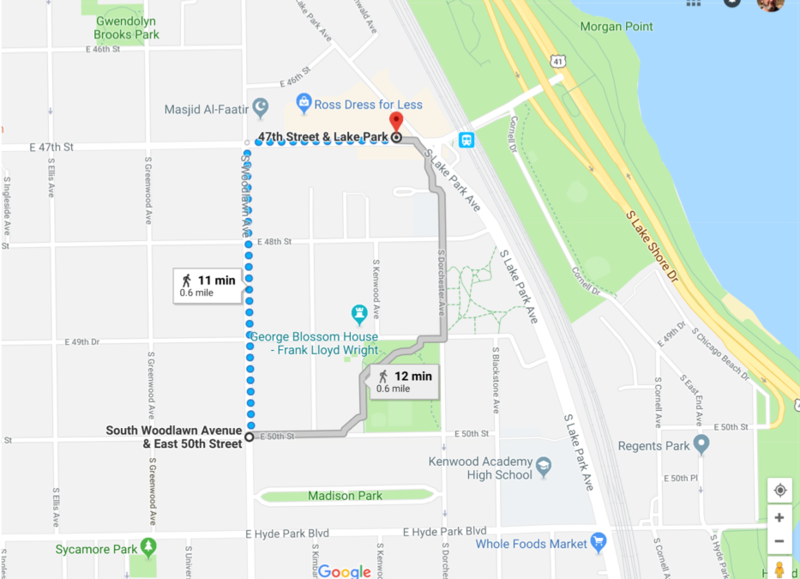 Google Maps instructs me to head north on South Woodlawn Avenue, then proceed to the Lake Park and 47th bus terminal. When I turn to walk left, the arrow points right. When I shift to go right, the arrow points left. Sighing, I cross the street and simply start walking. I glance down at my phone every few steps only to find the app still struggling to orient itself. 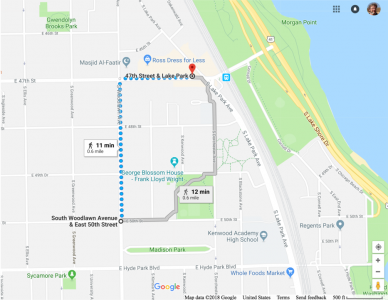 Google map of my walking options. Up ahead, a man is lugging a folding table and dragging a suitcase to the sidewalk. “Do you need some help, miss?” he calls out to me. Exasperated, I nod yes. I explain to him that I can’t find my bus stop. A faint grin spreads across his face. He points to a crosswalk a few yards further down. He tells me that if I make a right after I cross, I’ll be at my bus stop. I thank him and make it just in time to catch my bus. As I’m getting off the bus later that afternoon, I recall how distressed I’d been earlier and I laugh to myself. I remember how nice the man who helped had been and I realize I’d been in such a rush that I hadn’t properly thanked him. As I round the corner, I’m delighted to see him still there. I re-introduce myself to him and notice piles of soap, body creams and oils neatly arranged on his table. A neon colored poster with “Ginika Natural Body Care Store” scribbled in bubble letters is taped to the front of it. I tell him that today is my first day going into the city since I moved to Chicago and how much I appreciate that he stopped to help me. He tells me he understands how I must’ve felt and that he’d been there too. We exchanged smiles and I turned to walk home. My interactions with this man became daily, but limited. We exchanged pleasantries practically every day, but I never struck up a conversation with him. Each time I tried, a customer approached his table. Not wanting to interfere with his enterprise, I simply said goodbye and left. Throughout the weeks that followed, I managed to pull only tidbits of information out of him. His name is Onyedika. He goes by Anthony and reads the Tribune front to back each night. He makes all the soaps and oils he sells by hand with family recipes that have been passed down to him. All this is interesting, but I realize I don’t have a sense of who this man really is. One afternoon in September, I stopped to chat and told him about how earlier that morning, I’d given a woman who was new to the city directions to Grant Park. I remember her saying how much she appreciated me stopping to help her. “It’s funny how we can uproot and begin again somewhere new if we find people who help us to do so, no?” he said. For the next half hour or so, he told me how he’d started a new life in Chicago after he immigrated from Nigeria a few years ago. As he talked about the isolation, loneliness and discomfort he experienced after moving here, I felt a natural kinship with him. Onyedika had left an impression on me.